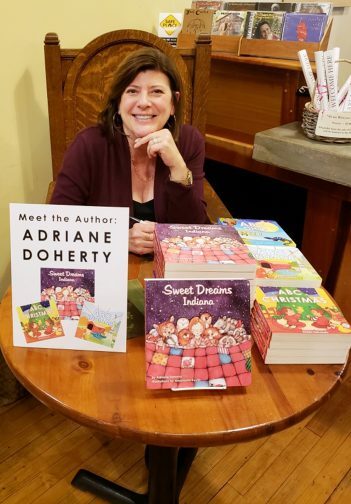 Adriane Doherty had been in the publishing and distribution side of the book business for 19 years. Doherty and her husband, Tom, own Cardinal Publishers Group. Yet, she had another ambition in the book world. “I always wanted to write my own line of books because I do the financial end of the company,” she said. The Carmel resident started a children’s book series with an alphabet book primarily focused on states. “Then I started ‘Sweet Dreams’ for the older kids,” Doherty said. Doherty will have a Dec. 7 book signing at 7 p.m. at the Barnes & Noble store in Stony Creek Marketplace, 17090 Mercantile Blvd., Noblesville. She will be selling three books, “Sweet Dreams Indiana,” “ABC Indiana” and “ABC Christmas.” There will be a Polar Express Pajama reading the same night. “My ’Sweet Dreams Chicago’ is (places) like the Bean (large public sculpture) and takes you through Chicago,” Doherty said. Doherty said each page has a hidden ducky on it. She started writing approximately a year ago. She has written five “ABC” books and two “Sweet Dreams” books. Another author has written one each in the series. Several others are scheduled to be published in 2019. “I like to write and like the research because I learn a lot about a state,” Doherty said. Her books are produced by Rubber Ducky Press. “It’s another imprint under the main business,” she said. Doherty has lived in Carmel for 22 years. She and her husband have three children, Marissa, 26; Tom, 25; and MaKenna, 19. All three are Carmel High School graduates. Doherty said the books have been changed to a dyslexia font. “Anyone who is dyslexic can really understand the letters,” she said. Doherty also will have a book signing from 11 a.m. to 1 p.m. Dec. 8 at the Civic Plaza in the Indianapolis International Airport’s Main Terminal near Security Check B.